For many seniors, staying active and finding rewarding hobbies provides many emotional and physical benefits. However, physical limitations like arthritis, heart conditions, or osteoporosis can make it challenging for seniors to fit in exercise. It’s important for seniors to find hobbies that keep them fit while providing mental stimulation. 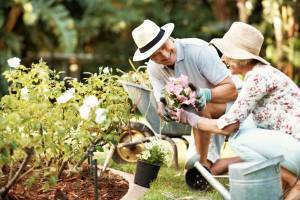 A fun and fulfilling activity, gardening is an excellent way for seniors to stay fit. Here are some of the perks of starting a garden this spring. Maintaining a garden takes commitment and effort, making it a great project for those with spare time. Plus, gardening provides seniors with a sense of accomplishment as they watch their plants bloom and thrive. Gardening also keeps seniors’ minds active, boosting their moods and maintaining cognitive function. Forming a connection with nature also provides multiple benefits. Whether you have a large property or are working on a smaller urban garden, being surrounded by greenery improves mental wellbeing. In fact, a Stanford University study provided by the Proceedings of the National Academy of Science found that being in nature for just 90 minutes each day can reduce depression. The rhythmic, repetitive motions of gardening also release stress-soothing chemicals in the brain, promoting relaxation. Plus, the act of caring for plants gives seniors a sense of responsibility and purpose. Gardening not only has mental benefits; it also provides a host of physical perks. Tending to plants is an excellent low-impact way to achieve exercise that boosts heart health and muscle growth. When combined with regular aerobic activities, just two gardening sessions each week can help seniors maintain coordination and cardiovascular health. Plus, exercise can ward off age-related health problems, including diabetes, stroke, high blood pressure, and cancer. The activities involved in maintaining a garden – weeding, pruning, and watering — engage muscle groups across the body. Gardening also requires seniors to twist, walk, and bend, which provide a balanced workout routine.